La voila, c'est Melissa aujourd hui. 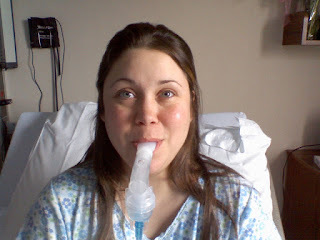 This is a breathing treatment. She just got back from her tests, we expect the results later today. And now she's eating her lunch, presented ever so delicately stamped as a 'large portion'. Mommy's been able to get a nap this morning and Paul is home from Chicago. Ok time to run. Just to let you know I have been following carefully. You know I wish you all the best. Take care of yourself. It was fantastic to receive a text from Melissa that she is going home tomorrow! I was in Minnesota when your invite to read the blog updates came Jenni... just got to look at it now - what a wonderful thing you set up - and greatly appreciated from those who are geographically far away.